3D Virtual Tour and floor plan available on request. What a beautiful setting for your New Mexico homestead! With almost 3,000 sqft, 4 bedrooms and 3 bathrooms, this home is ideal for all kinds of reasons. 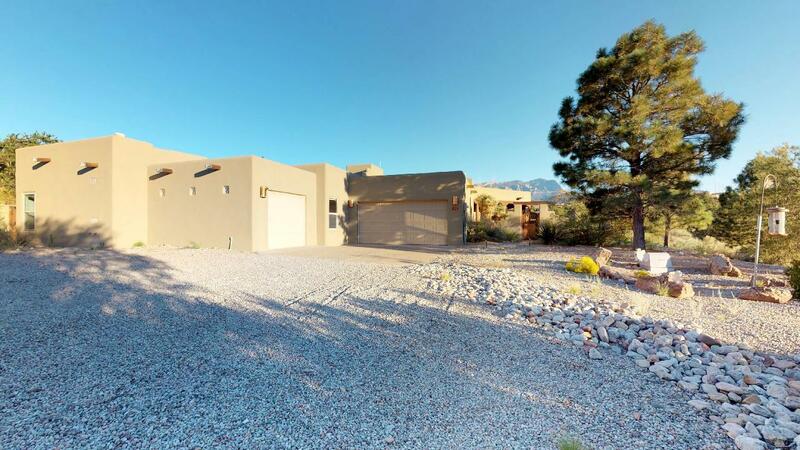 The outdoor patio area is my favorite, with expansive and impressive views of the Sandia Mountains, your front yard is your own personal nature observatory. This pueblo style home, comes all equipped with in floor radiant heating, 2 + 1 car garage that's Electrical Vehicle ready with a dedicated 220V outlet or can be used as a workshop. Ideally located, Placitas is only 15 mn away from Albuquerque and 35 minutes away from Santa Fe. DIRECTIONS: From The I-25 And Us 550 Head East Towards Placitas Then Make A First Left, North On I-25 Frontage Road, Until You Get To Camino Manzano, Then Go East Until You See The Sign.